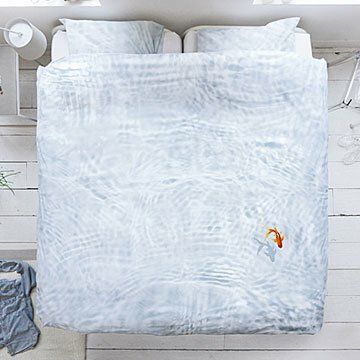 Drift off to sleep in this water scene featuring a single goldfish that "floats" near the surface. Floating in a koi fish pond: utterly relaxing. Drift off to sleep in one—gills not required—with Peggy van Neer and Erik van Loo's clever design. Featuring a photo-quality print that's been transferred to cozy cotton threads, the watery scene utilizes depth and light to create a playful optical illusion. The calming ripples and charming single goldfish that "floats" near the surface make the set an artful gift for nature-loving friends. Designed in Amsterdam, Netherlands. Made in Portugal. It is in a bedroom that is painted light blue and compliments the room.